Giving Back: helping students in the Copper Canyon and Guatemala — The best travel experience in the Copper Canyon--we live here! Handing out school supplies to a one room school for the Raramuri in the Copper Canyon. A world in which all boys and girls have their right of living, protection, development and participation assured, as the United Nations has established in the conduct of rights of the children. 1. EDUCATION: supporting the children with school supplies or uniforms, supporting the infrastructure of schools or communities, development of self-esteem. The Raramuri need help to educate their children. Doug with the Hotel Paraiso del Oso, has been going out of his way to make sure they can get an education. We like to help him. You can donate to help him educate and house many a Raramuri boy and girl in the Copper Canyon. Contact us for details. The boys and adults whom live in Guatemala face great challenges in order to develop. Approximately 80% of the population lives in poor conditions and 60% in extreme poor conditions. Illiteracy and poor nutrition is the highest in Latin America. The effects of 36 years of civil war and a long history of social, political and economic exclusion of the indigenous population, has resulted en a large majority of the population clamoring for access to health services, economic opportunities and education. 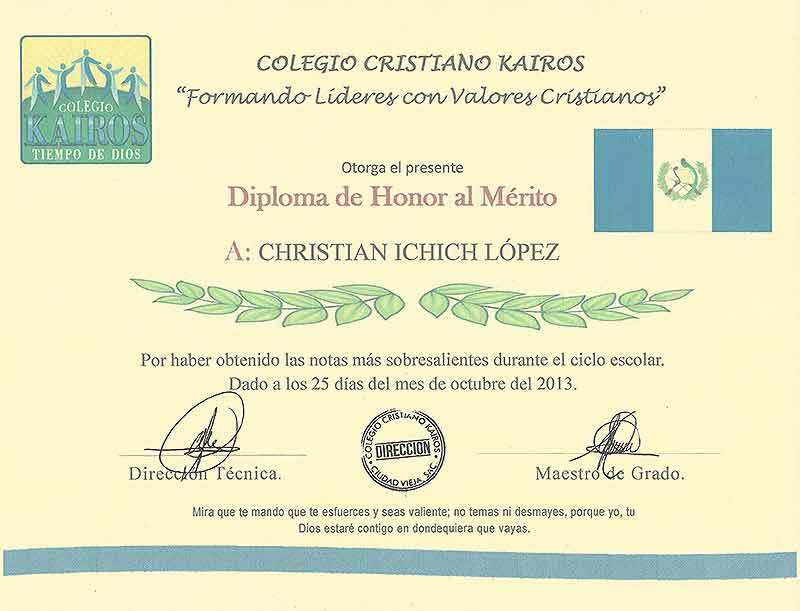 Since 2002 we have been helping the Ichich family and their children attend school in Guatemala. As Linda is now a single mother, we now focus on scholarships for their children Christian Jhonathan Ichich and Maria Victoria Ichich. My Name is Vicky, and I have many objectives and goals for this school year, which has just started, and I know with the help of God and with the help of people like you, who wish to support me this will be possible and become a reality. My dream, when I am older, is to start my own Architecture business. And to graduate in order to work and help my family, as they do not have sufficient means to do this. Another of my dreams is to be an Architect and a Psychologist, as this attracts my attention and I like it very much! I hope to count with your support. Well, before anything, I want to study to improve my life, support my mom, start working to help out a little with the expenses of food and other costs, more than what is necessary and if I study I continue to learn in order to become an entrepreneur. The past year I learned a lot about hotel management which entails how it functions, how to manage, what are the hierarchies etc.. I also learned about tourism, I took trips throughout almost all of the country visiting archaeological sites, museum, regions and much more. This year I wish to learn more about tourist places of Guatemala because I need to see a lot and investigate so much about what is tourism. This year I formed a soccer team besides my studies and we do not have uniforms, but I wish to find someone who can help us with uniforms in order to make our soccer team an excellent representative in the other areas we play as we have won, but our uniforms are very old and we need to buy new ones. I hope you have a very nice night and that this year, 2015, if filled with blessings for all. My name is Maria Victoria. I am 13 years old. My mother is Linda, my father is Santiago and my only brother is Christian and he is 15 years old, I am in the 6th grade. I like to study a lot, I like to play and have fun with my friends, I have been a flag bearer (first in my class) for abut 5 years, as I said I love to study, I really love my studies, I like it and it fascinates me. I have fought a lot to reach my goals and my dreams, but unfortunately my parents do not have the necessary resources in order to help me with my studies. I want to advance myself and to be a women who can fight and be victorious in life, When I am older I want to be a great Architect, I love architecture, I am fascinated with designing things. I like to draw and paint, I feel that to be an Architect is a lofty dream and that with Gods help I can realize my dream. I hope you can help me to realize my dreams. I will appreciate it with all my heart and believe me that my studies are the most important thing for me, in order to better my future and to be a great person, who can help her family. And to those who need it, I hope you find yourself in good health and that God helps you and takes care of you wherever you wish to go. Ciudad Vieja Sacatepeques, July 27, 2012. I cordially wish you success in your labors. By this letter I wish to thank you for the support that you have given to me in my studies, which helps me to continue fighting and preparing me academically, always, carrying in my heart that we have a God whom fills us with knowledge and understanding and that he puts in our lives generous people of a good heart like yourself. Hoping that the good Lord fills your life with blessings always. I am Victoria, my goals that I have for the next year is to study a lot, to get excellent grades, to continue studying in order to better myself and to make something of myself in life. My great dream is to be an Architect when I am older, as I love to decorate. I know that this year is an excellent year for study, I am ready to make an effort towards my studies, this year will be a year full of success, in which, I hope to continue studying and pass. I will put forth all my strength and persistence to my studies as it is very important to me to continue studying, because I know that this will serve me in the future in order to do be somebody. For those who need a tax deductible donation: please email us to let you know how you can receive a tax deductible donation from a sponsor 501C.